Weighing in at nearly 1/2 lb. each, you will truly be giving a gift of substance with these beautiful angel party favors. 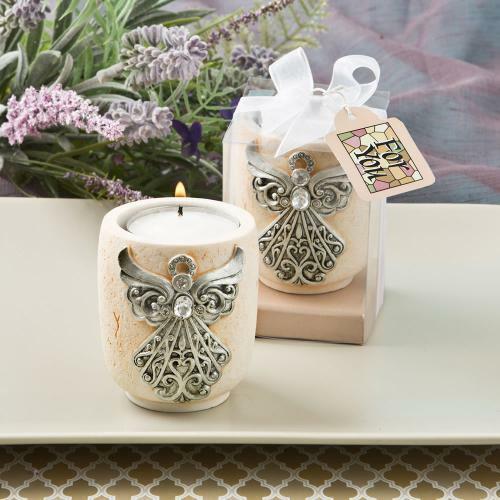 Our votives are fashioned from a thick poly resin base painted in an ivory color and decorated with a lovely sand stone pebble finish. On the side is a raised angel painted in an antique pewter finish. The angel is accented with small clear rhinestones and a large round clear rhinestone in the center. Included in the votive is a white tealight. A lovely and meaningful favor for a baptism, christening, communion or other religious celebration! Size is 2 1/2" x 2"
A heavenly favor for your next religious celebration! Please allow up to 5 business days to fulfill this order; add ship time from NY.